William Jennings Bryan was an American politician, lawyer and noted orator, a peerless leader and dominant force in the populist wing of the Democratic Party. Bryan was a devout Christian, a supporter of popular democracy, and an enemy of the gold standard as well as banks and railroads. He was a leader of the silverite movement in the 1890s, a peace advocate, a prohibitionist, and an opponent of Darwinism on religious and humanitarian grounds. With his deep, commanding voice and wide travels, he was one of the best known orators and lecturers of the era. Because of his faith in the wisdom of the common people, he was called “The Great Commoner.” He ran unsuccessfully as a candidate for U.S. Presidency three times. What would we expect of a chart for such a figure ? Perhaps Aquarius for his radical liberal politics and man of the people stance, Pisces for his pacifism and religious views and Gemini for his oratory ? Maybe also some Saturn for failing to get the top job 3 times. Well we would be right. William Jennings Bryan had the Sun in Pisces, a sign that was greatly strengthened by the fact that the Sun was conjunct its ruler Neptune. This is the classic symbol of an religious idealist with strong pacifist inclinations and this conjunction played out in the 11th house of politics. He also had the Moon in radical Aquarius which gave him a populist instinct and a feel for the common man and his issues. 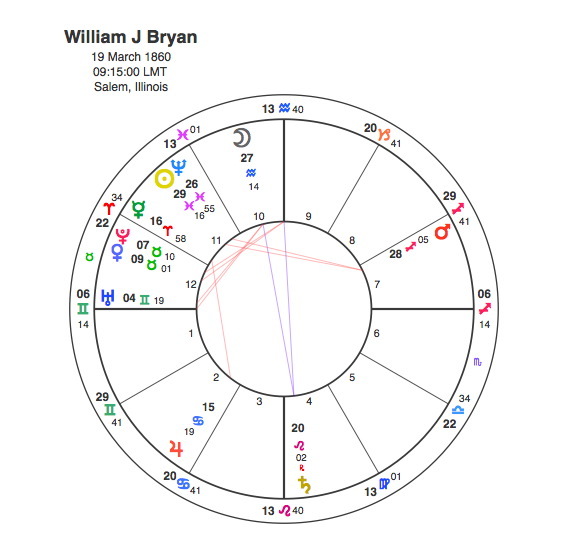 This placing was in the 10th house of career showing that these views would propel him to high office, but the Moon is in opposition to Saturn so he failed in his bid to reach the Presidency. Gemini is the talker of the Zodiac and this sign rising is always comfortable expressing themselves verbally. As Uranus is conjunct the Ascendant, he would express his unconventional views strongly and clearly. Bryan invented the national the principle that presidential hopefuls should tour the country making speeches when he delivered over 500 in his first campaign in an era when other candidates stayed home. It would actually be quite difficult to find a more conscientious and politically liberal birthchart than this and Bryan took a strong radical stand on so many issues that made him an extraordinary figure in politics particularly given that his time at the top was a century ago. Pluto made only one major transit in his adult life, the square to his Sun in 1912 – 15, but it encapsulated all the themes of his chart and showed both his strength of conviction and also a preparedness to sacrifice political ambition rather than compromise his ideals. President Woodrow Wilson appointed Bryan Secretary of State in 1913 just before the outbreak of the 1st World War. When the war began the United States proclaimed a policy of strict neutrality ” in thought and deed “. Bryan made several attempts to negotiate a treaty with Germany, but ultimately was never able to succeed. The agreements, known officially as “Treaties for the Advancement of Peace,” set up procedures for conciliation. In September 1914 he wrote to President Wilson urging mediation. ” It is not likely that either side will win so complete a victory as to be able to dictate terms, and if either side does win such a victory it will probably mean preparation for another war. It would seem better to look for a more rational basis for peace “. In 1915 a German U-boat sank the British passenger liner Lusitania, with 128 Americans aboard. This move strengthened anti German feeling and was the first major cause of the US finally joining in the war effort. Wilson repeatedly warned that the U.S. would not tolerate unrestricted submarine warfare, in violation of international law. William Jennings Bryan, whose pacifist goals were ignored by Wilson, resigned in protest in 1915. This marked the end of Bryan’s career in political office and he concentrated his efforts in the more Piscean directions of prohibition and fighting the Darwinian theory of evolution. William Jennings Bryan was an odd combination of the politically radical but religiously conservative but then Aquarius and Pisces might be next to each other in the Zodiac but are not particularly comfortable bedfellows. They would come together strongly over the pacifist question and Pluto’s transit ensured this marked the peak and ending of Bryan’s political career.